乳腺导管显示上皮细胞增生。上皮细胞呈多层，未见异型性。因而只有纤维囊性变，如纤维性增生、囊性变和硬化性腺病，没有增加患癌的风险。 These breast ducts demonstrate epithelial hyperplasia. The epithelial cells are multilayered. There is no atypia. 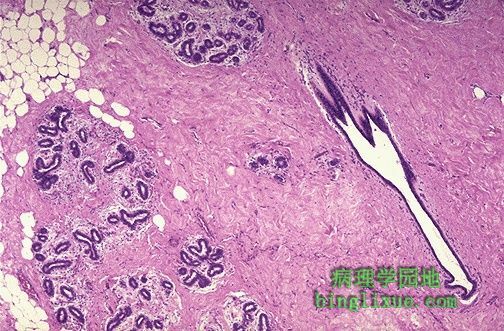 Thus, just as with fibrocystic changes such as fibrosis, cysts, and sclerosing adenosis, there is no increased risk for carcinoma.